Middle-aged women who exercised their facial muscles on a regular basis showed improved muscle tone and appeared younger to professional dermatologists. Now, then: A new study out of Northwestern University concludes that a regular regimen of facial exercises, sometimes called face yoga, can make middle-aged women look years younger — within a matter of weeks. That's the kind of bold claim you usually see in online ads with unfortunate font choices. But this time researchers have cold, hard science to back it all up. Using standardized methodology, the research team has delivered evidence, for the first time, that facial exercises really can work. The study was published the journal JAMA Dermatology. 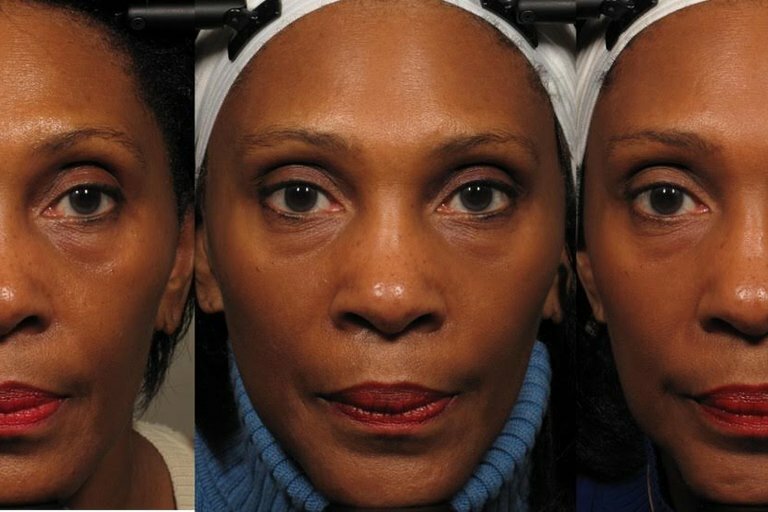 In a series of experiments at Northwestern Medicine, a volunteer group of 27 middle-aged women — aged 40 to 65 years old — participated in a 20-week regimen of specified facial exercises. The program required 30 minutes of exercises for eight weeks, then another 12 weeks of exercising every other day. Digital photographs taken before, during, and after the experiment showed that muscle tone in the cheeks improved noticeably over the course of the experiment. A panel of dermatologists assessed the photos using a standardized dermatology aging scale, in which 19 separate features of the face are measured and compared. The researchers concluded that upper cheek and lower cheek fullness, in particular, were significantly enhanced by the exercises. What's more, when dermatologists were asked to guess the ages of the participants, the average apparent age decreased over the course of the study, from 50.8 years to 49.6 years at eight weeks, then to 48.1 years at 20 weeks. Lead author Dr. Murad Alam, vice chair of dermatology at Northwestern Medicine, said that previous to the new research, there had never been a dedicated scientific study to test the premise that facial exercises improve appearance. “Assuming the findings are confirmed in a larger study, individuals now have a low-cost, non-toxic way for looking younger or to augment other cosmetic or anti-aging treatments they may be seeking,” Alam added. Researchers can't say for sure why the exercises seem to be effective, but they have some strong suspicions. Skin loses elasticity as we age, largely because fat pads between the muscles and the skin become thinner. In youth, these fat pads lock together like puzzle pieces, but as they age and atrophy, they tend to slip and descend. It really is just gravity at work. Of the 27 participants initially recruited for the study, 16 completed the exercises for the entire duration of the experiment. Researchers concede that the small sample size makes it a relatively limited study, and more research is needed to determine whether the results could be applied to other demographics — younger women, or older women, or men. The facial exercises used in the study were developed by Gary Sikorski of Happy Face Yoga, who is also a coauthor on the study. If you're interested in a little citizen science at home, links to instructions on the individual exercises are provided at the Northwestern Now website.